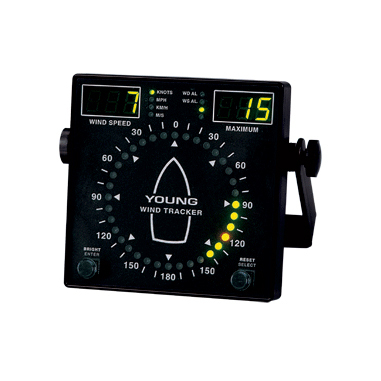 Developed from our standard Wind Tracker, the Marine Wind Tracker has special features for shipboard use. The Marine Wind Tracker is very compact for easy mounting on vertical bulkheads or consoles. Developed from our standard Wind Tracker, the Marine Wind Tracker has special features for shipboard use. The Marine Wind Tracker is very compact for easy mounting on vertical bulkheads or consoles. Wind speed is displayed in your choice of units: KNOTS, MPH, KM/H, M/S. Maximum wind speed is saved on the display until reset by the operator. Wind direction information is clearly displayed on a circular pattern of LEDs. Bold front panel graphics give a quick indication of wind angle relative to vessel heading. Brightness control allows adjustment for best viewing in any light. Luminous front panel markings allow viewing even in a darkened pilothouse. 4-20 mA inputs, Serial NMEA, and Voltage outputs are standard on the Marine Wind Tracker. Alarms for both wind speed and wind direction are included. The Marine Wind Tracker is very compact for easy mounting on vertical bulkheads or consoles. Model 06260 protective enclosure offers extra protection for wet or dusty locations.